Visit 3 Japanese cultural places such as Sumo, fish market, and otaku. Meeting up at Asakusabashi station at 10 am and riding bikes around Eastern Tokyo with a Japanese local guide. 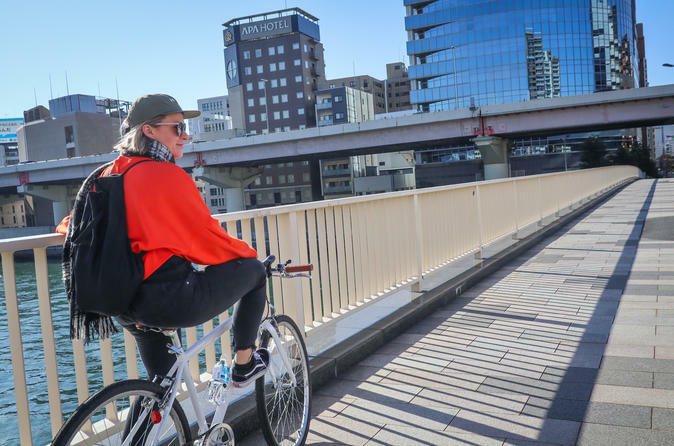 We visit many sightseeing spots riding through Tokyo local streets with hybrid cross bike such as Ryogoku (famous for Sumo), Tsukiji (fish market), Daimon (Zojo-ji Temple), Imperial Palace, and Akihabara (Otaku culture). During the tour, we stop by several spots including shrine, temple, Imperial palace, and Japanese seafood restaurant. You can do sightseeing efficiently and comfortably while having good exercise in your Japanese trip! This tour comes with an English guide and rental bike, bicycle insurance, so don't worry about communication and safety while cycling! Since it's a small group cycling tour, we can stop by any place on the way when you like for taking a picture or checking souvenir! Let's explore Tokyo in the best way! !